Top floor suite! Beautifully furnished unit overlooking the aqua blue waters of the Gulf of Mexico! This 1,700 square foot (including wrap-around porch), custom decorated condominium offers a unique ocean panoramic view. Split floor plan has centralized living area. Fully-equipped kitchen. Large master bedroom with king-size bed, private 3/4 bath, and walk-in closet. Relax and enjoy a cool drink on the wrap-around screened terrace overlooking Faro Blanco Lighthouse and Marina. Visit and savor dinner at any of the many area restaurants. Sunbathe or swim at nearby Sombrero Beach... only 3 miles from the resort. 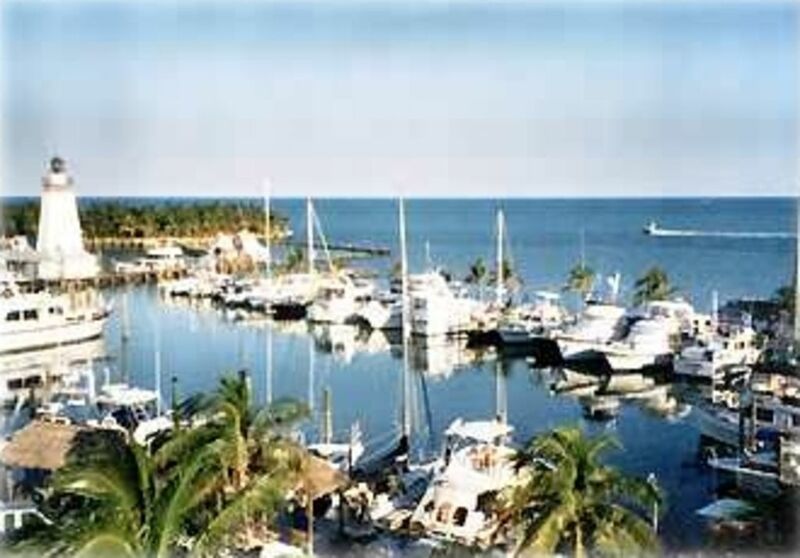 Marina Use: Daily and monthly boat dockage is available. Separate arrangements for a slip and trailer parking can be made through the abutting resort. Trailer parking is free. However, boat launching is not available on site but nearby. Guest Discount: Condo guests enjoy a 15% discount on food and beverages at the Yacht Club Restaurant and bar. Arrange fishing charters for deep sea fishing off nearby Seven Mile Bridge or snorkel on the area coral reefs. Less than an hour's drive is popular Key West and it's about a mile walk to Seven Mile Bridge to view spectacular sunsets! This unit is appealing to non-smokers as we ask that smoking be limited to the terrace. Sorry, no pets are allowed. Gary was born and raised in Minnesota and lived for many years in Michigan.. He moved to Florida in 2006 and has been enjoying the sunshine and beautiful waters of Miami Beach and the Florida Keys. Faro Blanco is a special place with excellent water views, lighthouse and the activity of a bustling marina (soon to be renovated). I chose the Florida Keys for a vacation destination for the past 10 years so it only seemed natural to want a permanent place of my own in the Keys. It is centrally located with great views, restaurants, activities, etc. While different from Key West with a small-town feel, Marathon remains close enough to visit the 'Conch Republic' when. and if, desired. I thoroughly enjoy walking along old Seven Mile Bridge on the way to Pigeon Key and searching for sealife in the shallow aqua/blue waters. Spotted rays, dolphin, shark, sea turtles and a huge variety of tropical fish are there - if you are lucky enough to see them! Marina is available for boat dockage and trailer parking on a first come, first serve basis. Trailer parking is free. However, boat launching is not available on site but nearby. Guest Discount: Condo guests enjoy a 15% discount on food and beverages at the Yacht Club Restaurant and bar at the resort. Please note: The unit has two bathrooms. Pool sharing and restaurant discount with Hyatt (Faro Blanco Resort) Place abutting condo property. Jet ski rentals at abutting resort. Close to a lot of fishing and eatery's. Great view of the Marina. Great views, well appointed place with all amenities one may need. Spacious, clean and very comfortable. Gary was very responsive and provided a wealth of information on the Keys, which we used. So centrally located that we could go to Key West in no time at all, as well as to Key Largo (equidistant). I highly recommend this Condo as it can accommodate lots of people without feeling overcrowded. There were 4 of us and we had plenty of room and privacy, with two good sized bathrooms, spacious kitchen and eating area. Accessibility to swimming pool was an extra well received. It is in a gated compound making it very safe and with a place for a large car or SUV. All the instructions were very clear and very easy to follow. We did not lack for anything and had a wonderful time. I would definitely go back to Gary's place for another memorable stay and recommend his place to anyone wishing to have a great experience in the Florida Keys. Condo was wonderful, clean, open concept, Great view and had everything you needed to feel at home. You have a short walk to pool and resturant with a great happy hour and view of bay. There is and elevator available for easy access. Appliances are all new and very clean. Gary was a great host. As another reviewer stated the pictures do not do this property justice. It has stunning views and is located in the perfect location with the perfect mix of privacy and activity with the Hyatt amenities near by. The marina is convenient to pick up your family for a boat ride, join a snorkel tour or a boat trip to pigeon key. The condo itself is very roomy, clean, has brand new appliances and is perfect for a family. The complex is gated and VERY quiet! The owner was gracious and has great communication to check on your stay. As for Marathon they are still continuing to rebuild from hurricane Irma as of July 18, but most everything is operational except a few restaurants like the IHOP. Thanks for a memorable trip for my family that we will be talking about in the years to come. My family really enjoyed our time here. The view from the balcony is beautiful. Gulf breeze flowing, pelicans fishing, boats passing by. Being on the 4th floor you can see so much of Marathon. This condo has eveything that a family would need for a quiet vacation. The condo is close to food, entertainment and the beach. We will be back next year if not sooner to relax on that balcony again. Thanks for sharing your home with us. The place was great for our family of four. Our kids liked having their own bedroom and overall the place was very spacious. We really enjoyed eating on the large screened deck and the ocean views. This was our first time in the Keys and Marathon is a good location to stay. We went to the nearby Dolphin Institute, Bahia Honda Beach, and Sombrero Beach is only 5 minutes from the condo and has a nice playground for the kids, as well as the warm water. We stayed here a week. It was an hour drive to Key West, but it was a nice drive with good views. The only negative thing I'd say is that, as the owner indicates in the listing, the area around the condo has significant hurricane damage from years ago, so don't expect to see an active dock area with boats, but there was no reconstruction going on while we were there, so there was no noise, large vehicles, etc, and the ocean still looked great! We saw a lot of seagulls flying around. Overall we really liked the Keys and are thinking of coming back next spring break. Dolphin Research Center (Grassy Key), Turtle Hospital (next door), Pigeon Key (two mile walk), Old Seven Mile Bridge (one mile walk), Bahia Honda State Park (12 miles), Key West (48 miles), Sombrero Beach (4 miles), Sombrero Reef (three nautical miles), Dry Tortugas (ferry from Key West).